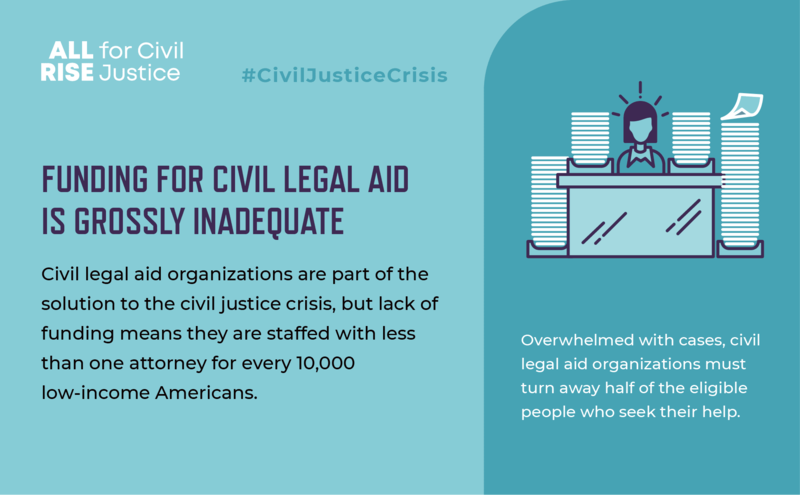 Every year, Americans encounter life-changing problems they can’t resolve because our civil courts are a complex maze. At some point, most people have a problem like a divorce or wrongful treatment by a landlord or debt collector and need a legal solution. 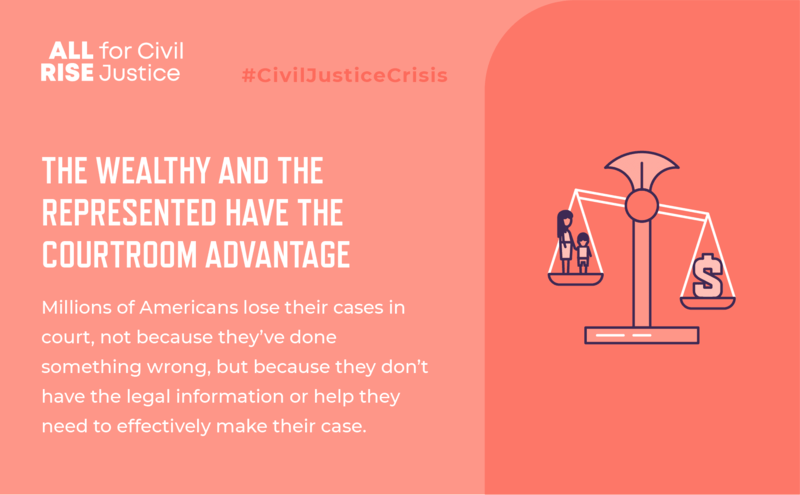 But millions lose their cases in civil court, not because they’ve done something wrong, but because they don’t have the information or legal help they need. A lease or even a deed is no guarantee of a stable home. 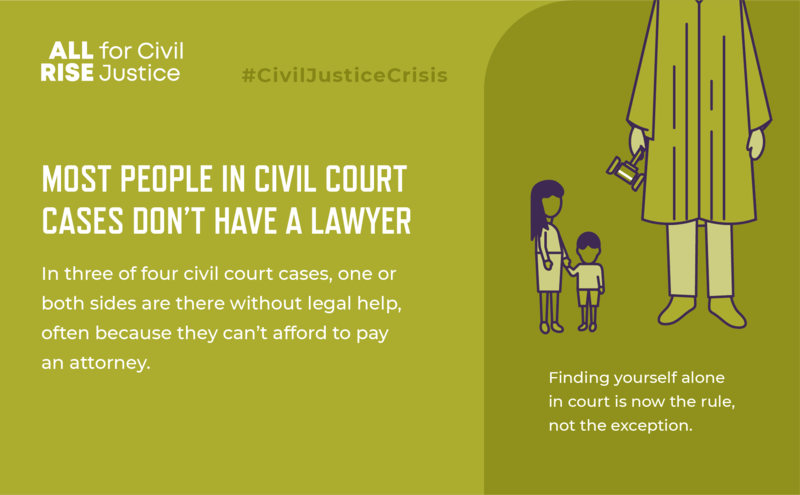 Wrongful evictions or foreclosures, health crises or even natural disasters go hand-in-hand with the need for legal help. No one should be forced to leave their home and have an eviction on their record because they don’t know their rights. When tenants are helped by a legal aid attorney, it’s much more likely there will be a solution that is fair and satisfies both parties. The legal issues that arise in the wake of natural disasters can be devastating and last for years. 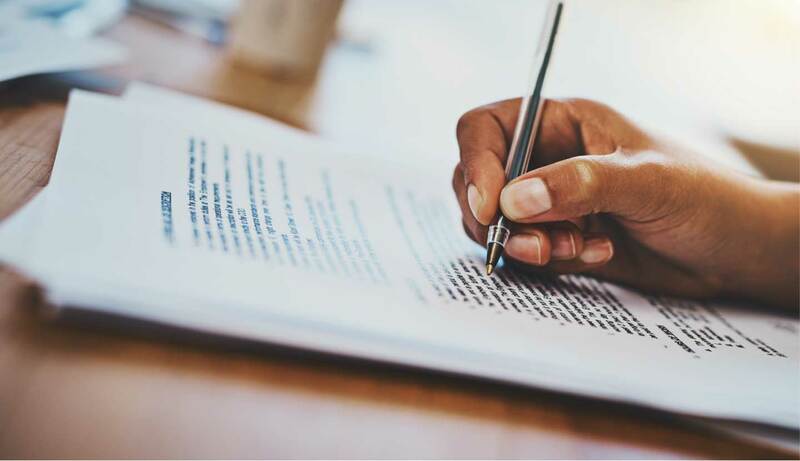 Without legal help, it becomes harder to avoid foreclosure, eviction and bankruptcy, deal with insurance companies and FEMA, and protect yourself against contractor fraud. When Sonja's knee problems got so bad that she needed help with basic tasks like cooking and laundry, she wanted her adult daughter to provide that help. 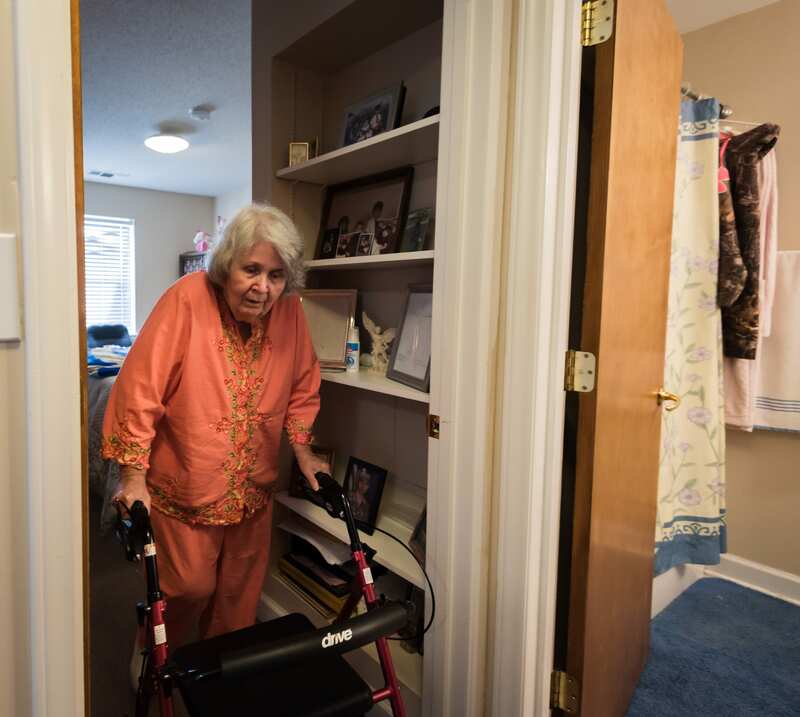 The process to certify a need for live-in assistance was cumbersome and difficult to understand. In spite of her efforts to meet the landlord's requirements, the property manager at Sonja’s subsidized apartment tried to evict her. 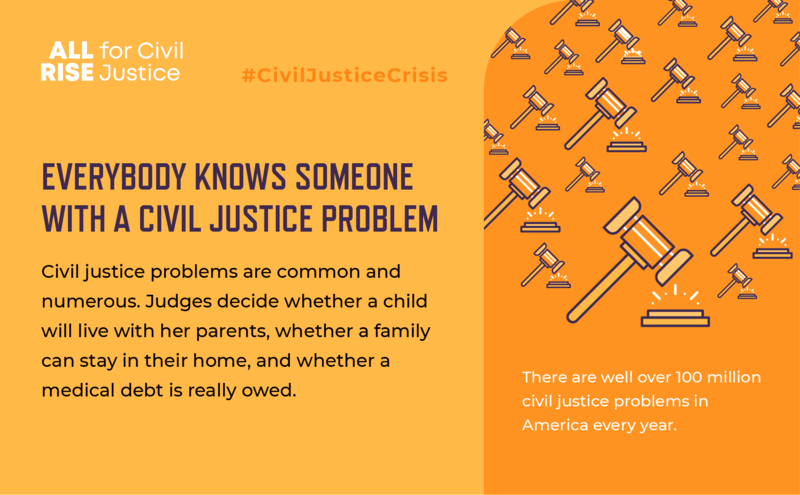 A civil legal aid attorney with Pisgah Legal Services helped Sonja stay in her home and get the help she needs from her daughter. We all want the best for our families. 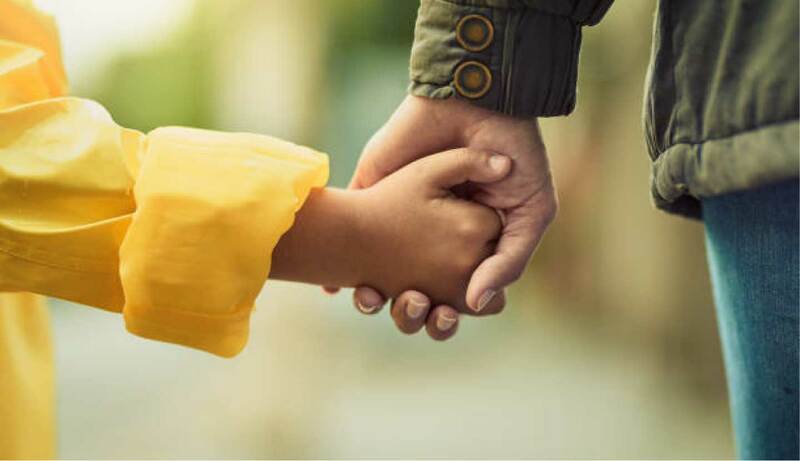 Whether that means parenting our children after a divorce, seeking protection from a violent spouse or partner, obtaining legal guardianship to care for a loved one, or keeping an immigrant parent and child together, going to court is part of the process. 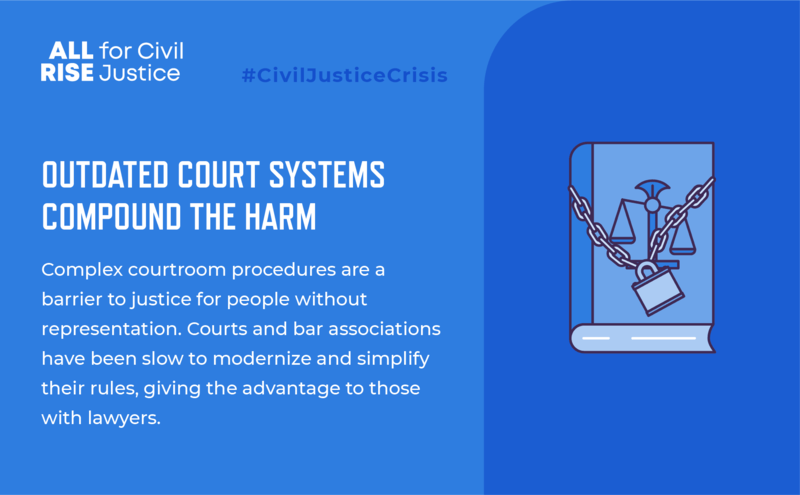 But too often, overly complex court proceedings and requirements present immense barriers to fair and just results. In cases of domestic violence, legal aid makes the difference in securing life-saving orders of protection. 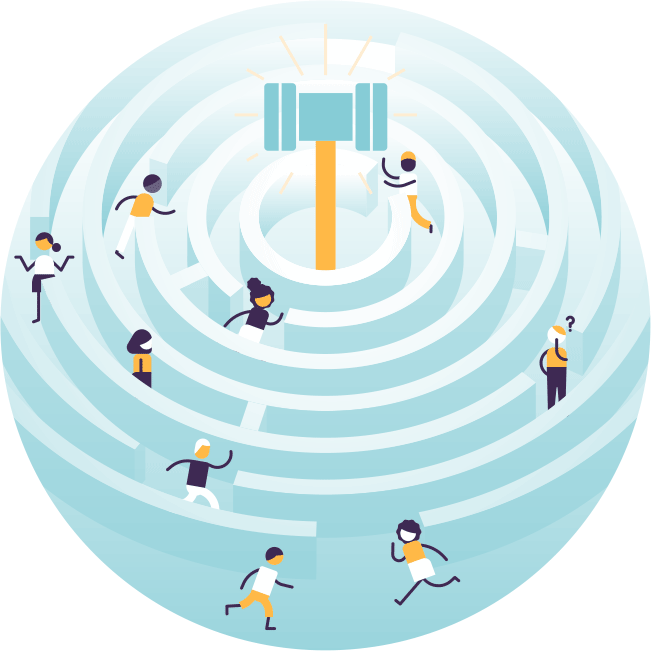 Research shows that having legal representation is the single most important factor in enabling victims to escape the cycle of domestic violence. Yet fewer than 1 in 5 low-income victims of domestic violence ever gets to see a lawyer. When parents are unable to care for their child and grandparents step in to the parenting role, legal guardianship is needed so grandparents can enroll the children in school and take them to the doctor. Likewise, when adult children step up to care for aging parents, guardianship enables them to handle their parents’ financial and medical needs. In both situations, legal help and court simplification are essential. What do you do when you’ve worked hard for years to provide for your family and ensure you’re taken care of, only to be denied health care benefits or have your savings wiped out by unscrupulous debt collectors? Veterans, seniors and lower-income Americans often do not receive the health care that is available to them. Worse, because of legal complexities people may find themselves denied health care benefits when they need them most. Debt collectors prevail in the majority of lawsuits – usually by default – even when the debt is not actually owed. With lawsuits brought by debt collectors at all-time highs, courts have been slow to protect basic fairness. When Bill went to his local Veterans Administration medical center 40 years after his service in Vietnam, he never expected to get help from both a psychologist and a lawyer. Through a medical-legal partnership there, he was able to get the legal help he needed to save his home, and counseling to ease the PTSD he had been living with for decades.